A Jute Floor Mat in a soft dark grey colour. Natural fibre floor furnishings, for an organic feel to your home interiors. The perfect size to use as a door mat in your hallway or kitchen. 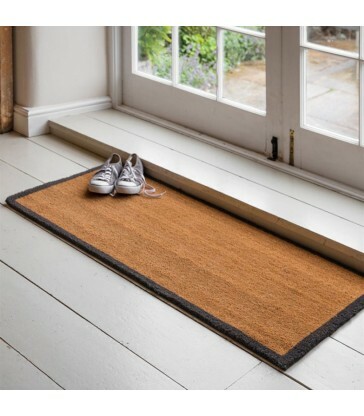 This doormat is made from natural Coir and finished with a charcoal grey edging. its long length makes it perfect to go in front of double doors. Designed for durability, its classic style will suit any home. For indoor use only. 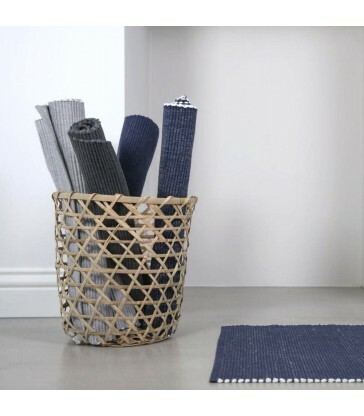 Our range of recycled cotton floor mats make great bathroom mats, easy to wash and soft under foot. Made from recycled cotton, they come in a navy blue and pale grey colour. Both colour combinations have a white trim on either end. Our range of floor rugs continues to expand with our eco friendly braided floor rugs. Oval in shape, this green and cream braided floor rug comes in three different sizes. It is made from 100% recycled plastics. For both indoor and outdoor use, these rugs are very hard wearing. Add a kick of colour to any room with our new eco braided floor rug. In a warm orange colour tone, its the perfect pop of colour to brighten up your day. And every rug is made from 100% recycled plastic so they are kind to the environment too. Suitable for both indoor and outdoor use, the orange floor rug comes in three sizes.